The Louisiana Superdome was rocking Monday night as only a New Orleans venue can rock, celebrating not just a 43-19 slaughter of the Washington Redskins but the epic accomplishment of quarterback Drew Brees setting the all-time NFL passing yardage record. It was a civic lovefest for the ages. Yeah, yeah, I know: Fans love star quarterbacks. What’s new? 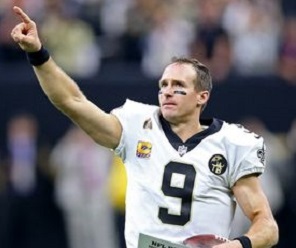 Well, most fans don’t love QBs the way New Orleanians love Drew Brees. (Rhyme intended.) Brees is a walking, throwing, living embodiment of a special city’s return from near-death caused by a huge brees, er, breeze, known as Katrina. That story has been oft-told: When some 80 percent of the Crescent City had been under water, the long-woeful Saints provided unity, hope, and a sense of mission, with then-new quarterback Brees, returning from a gruesome should injury, leading the way — all the way towards a previously unimaginable Super Bowl victory in 2010. But Brees didn’t just perform well on the field. For 12 years now he has been a genuine civic leader — helping found and finance charter schools, building playgrounds, regularly hosting leading citizens for private meals to plan new civic renewal projects, among similar charitable activities too numerous to list. On the field, not only has he long been the most accurate passer in NFL history (before this week also becoming the most prolific), but he has been a model of professionalism, sportsmanship, and team-first approach. With the Saints putting up top offensive numbers year after year, only to see its defenses regularly fail (sometimes spectacularly in playoff games that Brees and his offense seemed to have won), Brees never once (as far as I have seen or can find) has whined about his defense’s inadequacies or even idiocies, never once bemoaned his luck or his fate, but instead always just refocuses on how he himself can do even better and approach even more closely to perfection. This year, at age 39, Brees is on pace for what even by his standards would be his best statistical season ever, and perhaps the best season for any quarterback ever. His passer rating is 122.3, with 333 yards per game, a 78 percent completion percentage, 11 touchdowns — and not a single interception in five contests. Thus it is that New Orleans fans, who have been known to welcome and even celebrate players of the less strait-laced variety, have adopted the scandal-free, intense-but-approachable perfectionist as not just Saint but virtual guardian angel. Some of them even wear team jerseys proclaiming him a football Breesus (yes, spelled that way), sure deliverer of gridiron redemption. And Monday night, Brees was virtually unstoppable. He completed 26 of 29 passes for 363 yards and three touchdowns, ran for another yard, caught his own deflected pass for another yard — and, of course, threw no interceptions. The cheering crowd was so loud — repeatedly exceeding 100 decibels, according to a scoreboard monitor — that fans throughout my section were putting fingers in their own ears to mute the noise even as they, by yelling encouragement, added to it. ..